AFC - How Safe is the Beef Supply? How Safe is the Beef Supply? Slaughterhouses of 2006 a Different Kind of "Jungle"
Americans learned some hard truths recently about agribusiness practices and government secrecy. The U.S. Department of Agriculture and the dairy and beef industries falsely claimed there was no public health threat from mad cow disease in the United States. At the same time, we were boycotting Canadian beef for the identical discovery of a single cow with bovine spongiform encephalopathy. The federal government also failed to tell the public that 'downer' cattle too sick to walk and at high risk for BSE were being routinely processed for human consumption. Now, there are more secrets to reveal. It is time to educate ourselves about the misery endured by animals raised for food. This is not an extremist concern. Sen. Robert Byrd, D-W.Va., as well as a speechwriter for President Bush, Matthew Scully (author of Dominion), have spoken about the horrific treatment of farm animals. The bucolic farm of popular imagination, with its frolicking lambs, rooting pigs and contentedly grazing cattle, hardly exists today. It has been replaced by mechanized, highly intensive confinements of large numbers of animals whose treatment - no matter how cruel - is not covered by the federal Animal Welfare Act. While the USDA has just banned the practice of dragging, shocking and prodding sick and injured "downer" cattle to slaughter, it is still legal for farm animals to be transported for up to 36 hours without food or water, often without temperature regulation or adequate ventilation. Thousands become so sick or injured in transport, they die or collapse before they get to the slaughterhouse. Dairy cows are kept continuously pregnant, causing their overworked udders to frequently develop mastitis, a painful inflammation. Pigs are reared in mass-confinement buildings of several thousand animals or more. They lie on concrete slats, never seeing the outdoors until transported to slaughter. Pregnant sows spend years confined in tiny crates that are barely larger than their bodies and do not even allow them to turn around. Hens used for egg production are crammed into cages where confinement is so severe that their feathers are worn off from scraping against the metal wire. Their skin becomes covered with bruises and sores. 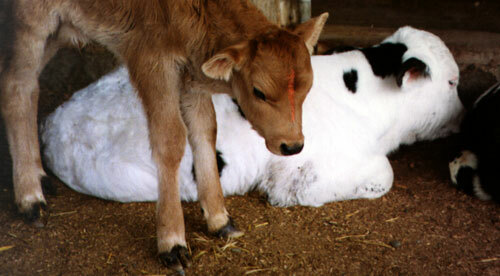 At slaughter, a stunner is supposed to render an animal unconscious before it is killed. Eyewitnesses and industry reports indicate there is a significant failure rate in the correct use of this equipment. Testimonials of the inevitable cruelty of mass slaughter are given by meat-industry workers in Slaughterhouse by Gail A. Eisnitz and in All Heaven in a Rage by Laura A. Moretti. If you doubt farm animals have the capacity for suffering, read the work of Temple Grandin (www.grandin.com), a professor of animal science at Colorado State University famous for her studies of farm animal behavior. In Dominion, Scully writes of Grandin describing pigs as "sensitive, sociable, communicative, alert beings who form images in their minds, think in pictures, respond to gentleness, fear harsh treatment, act by conscious intention, anticipate danger, make choices and dread slaughter so much that their emotional terror can trigger traumatic physiological reactions affecting meat quality." Refine: Purchase animal products obtained from humane and sustainable systems by looking for the Certified Humane label or buy only from local or organic producers. Reduce the amount you consume. Replace: Vegetarian options have never been easier to find, tastier and cheaper. Ask your supermarket to carry humanely raised animal products. Also, ask your California Assembly member to support Assembly Bill 732 that would ban veal and pig crates, 2-foot-wide enclosures where calves and pigs are confined for most or all of their lives. The price of a burger is greater than the human health risks, the environmental destruction, the use of cheap labor in unsafe conditions, and the disenfranchisement of small farmers that are the hallmarks of industrial agriculture. It is also the price of numbing ourselves to the enormous pain and suffering we perpetrate upon an inconceivable number of sentient, living beings. It is up to each of us to advance our society's humanity in our treatment of animals. We have the opportunity to do that each time we eat a meal. Marcia Slackman is a regional development officer (West Coast and Pacific Northwest) with the Humane Society of the United States. 08/29/06 Response to an Article "Parents' Negligence"